The VHF omnidirectional ranging (VOR) system is a navigation aid that gives magnetic bearing data from a VOR ground station to the airplane. The VOR ground stations transmit signals that give magnetic radial information from 000 degrees to 359 degrees. All VOR stations reference the 000 degree to magnetic north. 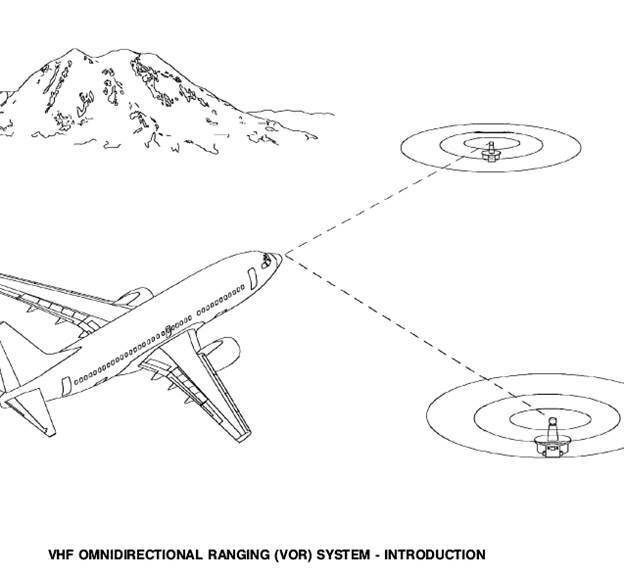 · VOR - VHF omnidirectional ranging. 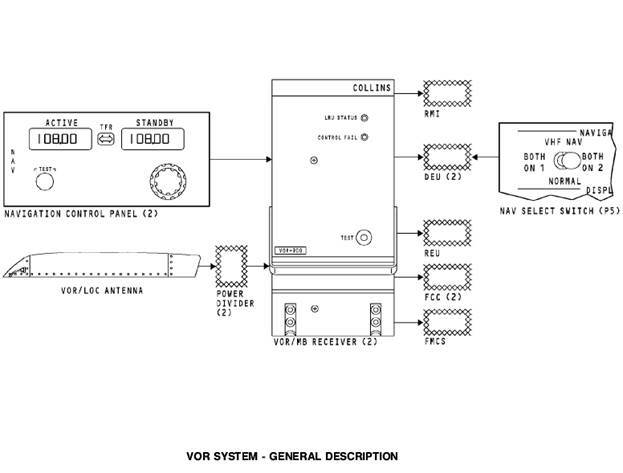 The VOR system has two VOR/marker beacon (VOR/MB) receivers. The receivers have VOR and marker beacon functions. 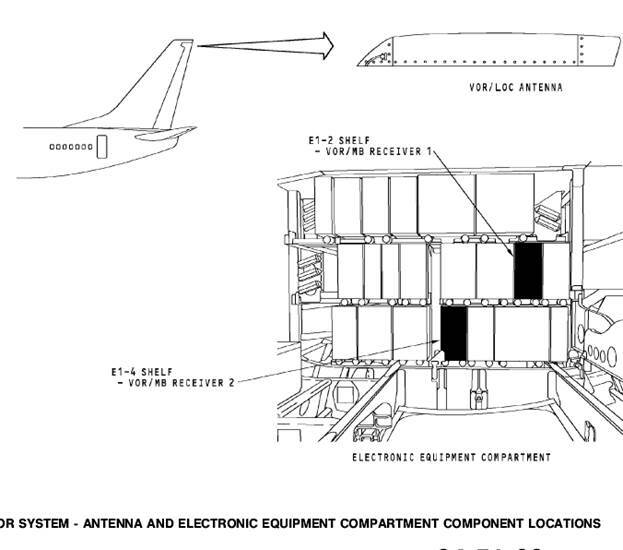 This section covers only the VOR operation of the VOR/MB receivers. The navigation (NAV) control panels give manual tune inputs to the VOR/MB receivers. 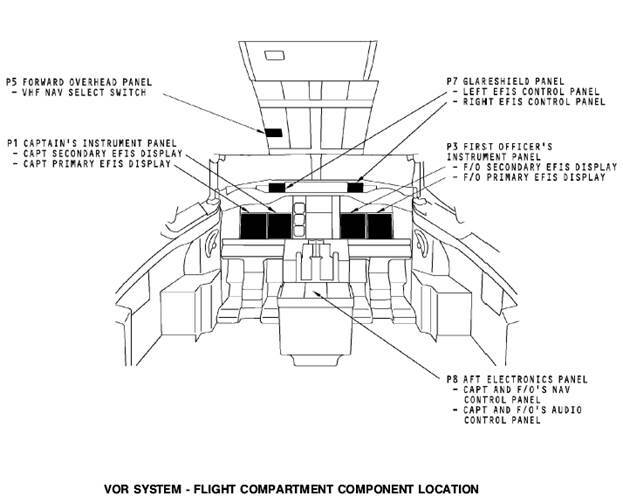 There are two NAV control panels, one for the captain and one for the first officer. RF signals from the VOR/LOC antenna go through power dividers, then to the VOR/MB receivers. The VOR/MB receivers use the RF signals to calculate station bearing and decode the morse code station identifier signal and station audio. The receivers send VOR bearing to the remote magnetic indicator (RMI). You can select the RMI bearing pointers to show VOR or ADF station bearing with the RMI bearing pointer selectors. The receivers send VOR bearing data to the display electronic units (DEU) for display. The NAV select switch lets the crew select VOR/MB receiver 1 or VOR/MB receiver 2 as the source for the captain and first officer displays. The receivers send station audio and morse code station identifier signals to the remote electronic unit (REU). The receiver sends VOR bearing data to the FCCs for the DFCS VOR/LOC mode of operation. The bearing data also goes to the FMCS as a radio navigation aid for present position calculations. · VHF NAV transfer switch. The VOR/LOC antenna is at the top of the vertical stabilizer. VOR/MB receiver 1 is on the E1-2 shelf and VOR/MB receiver 2 is on the E1-4 shelf.